At this time of year we are often asked, ‘What is your New Year’s resolution?’ And, you know, that can often make us think that we have to change something, or that we need to ‘fix’ something about ourselves. I have chosen to believe that I am a ‘work in progress’. This doesn’t mean that I need fixing, but that am going to use this time of year to think about what I want more of, and less of, in my life. As part of the team at Innovative Resources, I have access to all of our valuable resources, and was drawn to the Note to Self card set by Gena McLean as I reflected on this. I have always felt a connection to this resource; I think the practice that sits behind its creation (Choice Theory) and its strong link to ‘Mindfulness’ makes it a very useful resource for personal reflection. 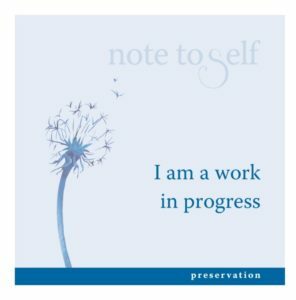 To go one step further, Note to Self has a card containing the words ‘I am a work in progress’ and three reflective questions on the reverse side. This card is part of the ‘Preservation’ suit, which seems quite appropriate for me at this time. What does it mean to be a ‘work in progress’? For me, this means that I don’t have to strive for perfection. What is perfection anyway? Being a ‘work in progress’ allows me to think about what I want to concentrate on next that will add to my happiness and good health. And, what it also permits, is that I may have lots of things that I want to do, but I don’t have to do them all at once, and not all this year. This year I am going to start a new hobby. In what ways am I learning and growing? With both my daughters in their twenties now, I am learning what it is like to be a parent of adult children. I hope that I am growing in wisdom and maturity in the way that I present advice and suggestions, and can continue to be their best friend. This year I am going to learn more about ‘active listening’ and go to at least one music concert or festival with my daughters. What parts of me do I want to preserve? This year I am going to step down from two committees that I believe are ready for new people and influences, to allow more ‘me time’. I am going to use this ‘me time’ to enjoy my new hobby. We can often be our own hardest task-master and put unrealistic demands on ourselves. Maybe a bit of preservation, consideration of self, and resources like Note to Self can help in setting some positive directions for you this year.